Okay here we go. In this post I deliver the promised code that handles automatic deployment of all your assemblies to client and server, as needed. For any of you who haven’t read the last two posts, I am talking about automatically deploying .NET assemblies to clients and server, from the database, on demand, at runtime. This will be heavy on code, so fasten your seatbelt and brace for impact. The reason why I do it this way is simple – to avoid deployment. I don’t want to deploy anything, I want this to be a zero-footprint solution, as far as .NET is concerned. My goal is to enable you to just import C/SIDE objects into the database, and be able to use it right out of the box, without any external dependencies you need to worry about at any point, now, or later. It has a private dictionary that keeps a map between fully qualified assembly names and assemblies. When .NET runtime asks my class about an assembly, it will primarily look into this dictionary. It has a public method to add an assembly to the map. This method can be called by NAV to feed my class with assemblies from the database. It subscribes to the AssemblyResolve event. Inside it it first looks if the assembly exists in the dictionary, and if it does, it returns it. If it doesn’t, then it raises an event in NAV and allows NAV to resolve the assembly and call the ResolveAssembly method to feed the assembly into the dictionary. After calling C/AL, the event handler looks into the dictionary again, and if it finds the assembly there, it returns it. Since calls from .NET to C/AL and back are synchronous, this works as expected. The primary key is the first three fields, and let me explain why. First, I want to identify the assembly through its fully qualified name, that’s the first field. Then, I want to be able to bind an assembly to a user. Maybe, just maybe, I’ll want to load different assemblies for different users. If nothing else justifies it, then testability does – you can bind mock assemblies to user accounts used for testing. And last, I bind it to a tier. It’s an option field with three values: Both, Server, Client. Here I can choose where I want the assembly to be deployed when needed. Client assemblies are deployed to client, Server to server, and Both to both. Duh! No magic in here. It receives a stream containing the assembly bytes, then a System.Reflection.Assembly by reference, to return the assembly to the caller, and name – if for some reason you want to store an assembly under a different name than the one reflection can look up inside – I’ll explain why a bit later. This function then loads the assembly from the stream, looks up its name, creates a record for it, and streams the assembly bytes into the BLOB field. It shows the import dialog, retrieves the selected assembly loaded in TempBlob, reads the stream from TempBlob and passes it onto the InstallAssembly function in the table. Okay, now that you’ve seen the code and objects for keeping assemblies in line, let’s go back to the codeunit that manages all this. One of my design goals was to make it possible to deploy new assemblies live, without having to restart the service tier, and without having to restart the client, if possible. I also want to minimize unnecessary loading of assemblies. So I created a single-instance codeunit to host my assembly resolver assembly I showed you how to compile. This function retrieves the BLOB from the database, and converts it to a byte array. So, here we have three functions: one that decides whether to load or compile the assembly, and two functions to load and compile, respectively. I assign the reference to the instantiated object to a System.Object variable. Then, based on the desired tier (client or server) it uses reflection to access the ResolveAssembly method and call it. I need to do it twice, once with server-side variables, once with client-side variables. That’s important. The Resolver object received as a parameter does not need to be declared twice – it’s by reference, and it carries its RunOnClient flag too. Now, this ResolverNst := Object may seem redundant at this point, but it isn’t. It would be if ResolverNst was of System.Object type, but it isn’t. I won’t reveal just yet what it is, because if I do, it’ll twist your brain. 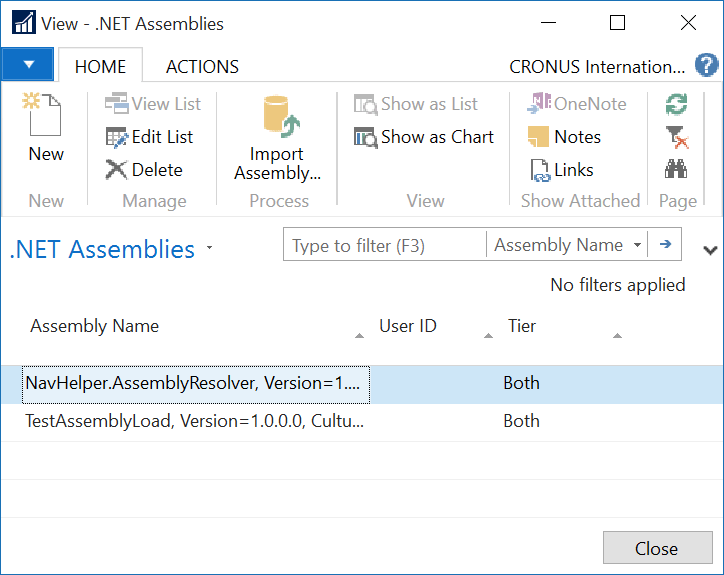 If it isn’t obvious, it iterates through the .NET Assembly table, applies the user filter, and then calls the ResolveAssembly method with either ResolverRtc or ResolverNst, depending on the Tier option setting of each record. Now, I said you don’t need this for the service tier, and you absolutely do for client. Why? Simply because you can’t have client-side .NET events in non-page objects in C/AL. Since we are in a codeunit, a client-side event is not allowed, so the client-side resolver must know about all assemblies up front. Server-side, on another hand, can raise events, and we can subscribe to the OnResolveAssembly event. And now comes the trickiest part of all. First, we assigned the instance to System.Object, and setting WithEvents to Yes won’t do anything because this class has no events, and even if it had any, it must have the OnResolveAssembly event to be able to respond. So how in the earth do you subscribe to an event from a class that you just compiled at runtime? This function is hardcoded to resolve an assembly on the server side. I need it to properly apply filters, and to load an assembly using the server-side CASE. This event will fire when the AssemblyResolver class fires the OnResolveAssembly event and asks C/AL to provide an assembly for the specified name. So – how did I get this event into my codeunit, because it certainly doesn’t come from System.Object, and I don’t even have my AssemblyResolver class yet, it will be compiled by runtime. ResolverNst has WithEvents set to Yes, and ResolverNst has RunOnClient set to Yes. This will fail, because to properly execute this line, NAV runtime must have access to the assembly containing this type. And since the assembly resolver will not be executed before this line fully executes, this fails at runtime because at this point, type NavHelper.AssemblyResolver.Resolver is unknown. This is legal, because I am assigning to System.Object variable, so at this point only System.Object type must be known – and it always is. Only at this point it contains a valid reference to an instance of NavHelper.AssemblyResolver.Resolver. The first line “teaches” my assembly resolver about resolving this particular assembly that hosts the assembly resolver class itself. Then, at the point when I assign my existing instance (referenced by the Object variable) it works, because at this point, the assembly is known, and variable assignment works. In a nutshell, it compiles an assembly and then users that assembly to resolve itself for the purpose of initial assignment to the variable of a type which is otherwise unknown at this point. Obviously, I could have done it even without pulling this stunt, if I wanted to settle for the please-restart-your-client for my service tier to access any assemblies added to the .NET Assembly table after I first loaded this codeunit. Since I want my codeunit to be able to resolve any assembly, even those added live, during runtime, I wanted to expose the OnResolveAssembly event to C/AL to be able to resolve assemblies that were not in the database when the codeunit was first instantiated. This makes it extra useful. And finally, last piece of code you need to do, and you’ll need to do it on your own – just run this codeunit from codeunit 1, OnCompanyOpen or something. It will install itself and live there for the duration of your session. For development purposes, add all your assemblies to the RoleTailored Client Add-ins folder. This will allow you to compile your code. And this solves the NAV DLL hell. I feel it does a far better job than automatic deployment of assemblies in NAV 2016, and it’ll also run under NAV 2013 and newer. Download the objects by clicking here, and do let me know what you think of this solution. I have only one concern – if we are using NAV over internet with ClickOnce install, using this solution would mean that all DLLs are downloaded each time when session is started. But maybe it’s not too big load. It’s not much of a concern. This would apply only to client-side dlls (and you probably don’t have many of those anyway), and even when you have to send them over, most dlls will be under 100 kb in size, unless you beef them up with image resources. Plus, it’s up to you – you can always cache them locally if you want, and then instead of streaming them every time from server, you can load them up from local file system. Having an action ‘Import Assembly’ on a Page still requires to have files available that can be uploaded in the page. It could be extended by automatically initializing that Assembly table. Assemblies can be provided by embedding them in a Codeunit or by making them available via a web service. Company Initialize / Upgrade Codeunits / whatever Initialize Codeunit could then pull the assemblies and automatically populate the Assembly table. By the way – as I said in the post – this does not take care of client add-ins. As far as I know, you can’t “resolve” them using AssemblyResolve event, as they are not resolved through standard .NET process. Microsoft has invented their own wheel here, the ControlAddInExport, and what Microsoft does here is enumerate through all dlls and looking for a type that’s decorated with ControlAddInExport with a matching name. There certainly is a way to tap into this, as well, just not with the piece of code I put here. I might try to hack my way into it once, or maybe you can as well, but for now this is a limitation of the solution I give here. (slowly clapping) That is some major C#-fu you have going on! Thinking of any possible drawbacks with this, how about the following situation: let’s say we have a bunch of assemblies that we’re using on the client side. Am I right in assuming that using this deployment method, all of them will be downloaded from the mid-tier during each RTC startup? So, if we have NAV deployment with clients connecting directly over WAN and a 100MB worth of custom assemblies, those will get pulled each time RTC reconnects? Anyway, as I said to Viktoras – you are free to cache all client-side dlls locally and stream them over the wire(less) only for the first time. It’s easy to extend the C/AL code to check whether an assembly exists in some local temporary cache before deciding to pull them from the database. The true value here is not pulling from database, it’s generic runtime assembly resolving from a byte array, which can come from any stream. Database, file system, C/AL objects even (as Arend-Jan points out) – sky is the limit. I’ve shown you how to launch your rocket, now you go and fly it any way you want. Ever since I saw Waldo’s solution for building a .NET class on the fly I’ve been thinking about trying to build something like this that meant we could build our .NET DLLs in the appropriate place (Visual Studio) and just deploy on the fly. I originally got the trick from one of my developers .. also a brilliant mind, just like Vjeko. That’s what I said on my session .. I merely shared the trick ;-). Very intelligent solution! Good job! seems like you messed up the identifiers a bit. In the codeunit you declared NavHelper.AssemblyResolver.Resolver, but the class is actually called NavHelper.AssemblyResolver.AssemblyResolver. I changed the code in GetSource and the global TextConst TypeName then it worked. Thanks for the great solution! Yes, I noticed that as well. If you take the demos from my TechDays 2015 upload, there it’s all sorted out correctly. BTW you should do a IF NOT GUIALLOWED THEN EXIT in the OnRun of the COdeunit, If the Codeunit is called from a webservice you get an exception. Actually, the check should be done from the places where the client-side functionality is used. The code should still run under web services, and only GUI specific things should not be accessible. If you download the demo from NAV TechDays 2015, this issue is solved in there. I have downloaded your NAV Objects and was able to generate your Helper Class (after modifying your code). After copy the generated file into NAV Client AddIn Folder I am not able to compile, because the helper was not identified. Can you please publish the dll for download? Yes, I have noticed this issue, I’ll make some changes to the NAV code and C# code and then publish this again, then it will work nicely. Sorry for this issue. Seems you already noticed the issue that the ResolverNst and ResolverRtc variables are of type NavHelper.AssemblyResolver.Resolver while in the GetSource function I see that the class is called AssemblyResolver. Yes, I did notice it, and I fixed it ahead of my NAV TechDays 2015 session – if you take a look at my NAV TechDays 2015 demo code, you’ll see that it’s fixed in there. I’ll try to do what you suggest here, it does make sense, indeed. One thing that would make this even more awesome … would be the possibilty to include assemblies right from a NuGet-Package-Source… And an In-NAV-Dependency-Tracker like … a Codeunit that exposes a single function that enables other objects to declare that they require a certain .NET assembly. And your resolver resolves it straight from the NuGet-Source. Maybe a “private” one hosted by the partner … That would then be really ZERO deployment. True, true 🙂 Good hint! Shouldn’t the .NET Assembly table be set to “Data per company = No”? Doesn’t make sense if that’s Yes, I think. ” I’ll make some changes to the NAV code and C# code and then publish this again”. Do you have had time to do changes and publish again? Hi Vjeko, I think I found a major memory leak in your solution. Every session is creating that resolver class and loading the assemblies in memory. .NET needs only the first one, because that will resolve the requested assemblies. But worse is that the resolver instances are never released by the garbage collector, because AppDomain.CurrentAppDomain.AssemblyResolve event has a reference to it. Same applies to the client side when switching from company. If you drop me an email, I will send you my latest code. Maybe you could should your fix at https://gist.github.com/? That would be great! Be aware that it is less functional than the original code of Vjeko, but enough for my purpose. And I use the TryFunction of NAV 2016. I don’t have the code of the resolver included in NAV, but just in a regular .NET assembly which must be available in the table in NAV. The main difference in architecture is that the codeunit is not singleinstance anymore, but the resolver class has a static property of itself. This way you have a singleinstance at application/service level instead of NAV session level. If you need more clearification, leave a comment on the gist. Hi, it looks like Nav is now doing a similar thing… compiling at runtime c# version of C/AL code, isn’t it? Yes, NAV has been doing that since version 2009. We can do it from pure C/AL since 2013. Hi, I am beginners in Dyn Nav, so my question may be surprising for you. During Codeunit (76101) compiling (on DynNav 2013 R2) i get error: ‘NavHelper.AssemblyResolver.Resolver.’NavHelper…’ can’t load.. I use your DLL from your VS Project ‘Vjeko.Com.AssemblyResolver.sln’. Can you tell me where i have to add this library? I’ve tried to add them into AddIn’s directory and later into Table76101, but without luck :(. It seems a lot of you guys had the same issue. Can you please check the latest version at github.com/vjekob? But currently, after the migration to Nav 2017 we noticed and issue. that is even reproducable in the Cronus DB. The issue is, that if you try to Debug something, the Debugger hangs, and leads to an Crashing NAS. We tried to solve this, by removing some DLLs (we thought, it’s may something, that is in one of the loaded assamblies) but, even if the table with the Dlls is completly empty (and all the cashes Cleared) the behaviour stays reproducable. We “just” imported the objects into the cronous, ran the “init” method of the Codeunit, restarted the app server and than tried to debug the “on Open Trigger” of the “Company Information” Page. 3) We Logged all DLLs and instanciations to see if there is anything “not resolvable” or “old Versioned”. But it isn’t. We inserted an exit into the “onCompanyOpen” Trigger Method, what leaded to a working debugger. Hi Torben! Thanks for the comment and for bringing this to my attention. I am not aware of these issues, and apparently I’ll have to work on making this compatible with AV 2017.
in-between i detected the reason for this behaviour myself. i found a stack trace in the system, after activating the extended logs in the registry. The stack trace said, that a class could not be loaded (that could be loaded while the CU to dynamically load the dlls is not integrated in the system.) This class is part of the “Microsoft.Dynamics.Nav.Client.CodeViewerTypes.dll” that is normally located on the App Server Directory. To solve the issue, we just imported the Assembly into the Table that stores the Assemblies and see… it works fine. To finalize the logic, we extended the provided Codeunit from this tutorial, to check at the beginning, if the Dll is already imported and otherwise to “try” to import it directly. The dynamic Assembly loading works now fine in Nav20107. Great, thanks for sharing this! Yes, of course you have to import all of dependencies, otherwise it can’t work. you can forget about my last post, I mixed did not see that the Nav Objects were included in the files of the Visual Studio Project. firstly I want to say thank you for this great stuff here! Secondly I want to ask for help on a problem I have with this. I created the DLL with the latest stuff I donwloaded from the GitHub link provided at the beginning of this post. I also downloaded the Nav objects (freom the DLL hell part III) and imported those into our Nav 2017 system. ‘MemStr’ is declared (in function InstallResolverAssembly) as DotNet variable and inside the function ‘InstallAssembly’ (this is located in the .NET Assembly table) the parameter ‘InStr’ is declared as InStream. What is the correct way to solve this problem now? I have a problem if I run Nav 2017 client after installation of Nav objects and AssemblyResolver.dll.